That Lynn, she’s so zippy. One more small scene and we’re done with this chapter, please look forward to it! Do you think it’s made out of lead? So it’s a lead “zeppy” Lynn? We puppets have something that other nations sorely lack, WE HAVE ZEPPELINS! Well your Monarch does seem to have an extraordinarily ample supply of hot air. That and he keeps you in stitches. Did it take this long for the new comic because you had to decide wether Lynn should be a Dragon or because you need to decide how likely it was to get sued if she was a Kabula clone? 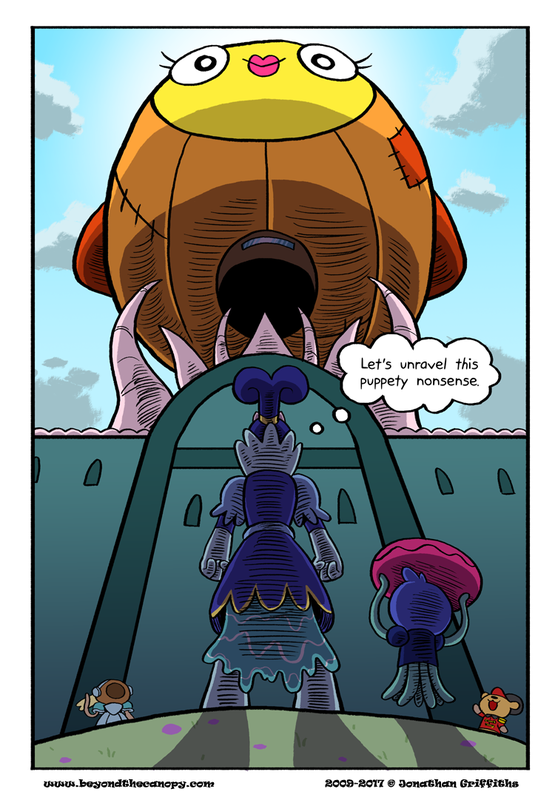 Puppety Nonsense would make a great band name. Unfortunately, it would probably be a terrible band. YOU’VE AWAKENED THE FINAL BOSS! Will it be Glade, working through the mysteries of Vesa at least for a little? Or Glenn, having a discussion with DEWEY and Sebastian about going to the Northwest? Or prehaps even good ol’ Greliz and Jojo off to crack the code or something I don’t know. Then again, Bonebone (?) and Shambles could easily be plotting their next move…. when is the next page coming out??? Ack! It’s been over a month since your last update, think of Grandpa Bramble! Will Vespa ever see Glenn again? Will Marzipan flow freely through the streets of Cascadia? Will there be a full fledged assault on the Canopy by a taco based armada? Who knows! Only an update can save us! Dear GReLiz (or Johnathan Griffiths), I really hope you are alright. While I can understand family issues, and that you are at a good spot for a hiatus (coughHelveticacough) I must say that we could use a “Hey, not dead, just REALLY busy” post from you. No offense meant, and I hope you can work out any issues you are currently handling. I just put up a status update earlier today, it’s right below! Good to hear you haven’t vanished! I hope you do better, and good luck. THE BEAST SHALL ARISE FROM THE BRIGHT HEIGHTS OF THIS NICE GLOWY PLACE IN THE SKY. WE DON’T KNOW WHAT IT IS BUT THERE’S PLENTY OF MARSHMALLOW FLUFF AND HARPS. I am fine with waiting a bit longer. I do hope you can resolve things sooner or later though, but that’s your decision not mine. As much fun that this webcomic has been, I, for one, am kind of sick of checking back daily for radio silence. I understand that life is hard, and I’ll probably check back in the future, but I think it’s my time. Thank you, Jonathan, for the memories. If not, then at least it isn’t like Helevetica where it is in the middle of all sorts of things instead of here where it is an appropriate ending for a brief hiatus. I’d say check like weekly. I’m checking when I remember, which is more often than that but weekly is a good premise of a schedule. @Greliz please come back as soon as you can, I hope you do better and maybe show us a small early sketch of Glenn or a guest comic or something as proof of “I’m not dead”? I’m alive. My grandmother’s currently in the hospital, she’s 100 years old and we’re taking shifts watching her. Between that and my part time job I’ve been juggling some freelance stuff that HAS to get done so unfortunately everything that isn’t those things is on hold again :’) Once things settle down I’ll be getting back to it. I hope your grandmother does well. If you could ask a fellow artist to make a small guest comic, that would be nice but that is up to you. I hope you can get everything sorted out soon. I’m sorry, that sounds like a lot to deal with. Your mental health is more important than getting a new page out, so don’t worry about it! I want to get a new page, but it’s okay to deal with that. Hope your grandmother gets well! Thank you for the excellent quality, very engaging comic. I hope your situation improves, and I wish the best of health and prosperity to you and your family. No, his grandmother is in poor health and he is dealing with economical stuff. May to October, so 5 months withe the occasional “I’m not dead yet!”. I get the feeling that Real Life [tm] has shanghaied our author and we may never see them again on these shores. – see: Crowbar, Argh!, Sakana, Urban Jungle, Candi, Faraday …..
Hey, he has a serious reason. That’s better than nothing. Better than Moe at least. In the end it’s all his decision, and whatever he chooses to do is fine, but I do think he’s coming back eventually. There’ve been long breaks before. Hey, if I’ve had the heart to check by every week or so then, then nothing’s gonna stop me from checking up on the webcomic now. Drawing gives people all sorts of catharsis, but sometimes bigger issues take precedence. Give us an update sometime, Greliz, but don’t mind the people who are getting impatient. If Greliz can contact one of his fellow artists and ask for a guest comic, then he could show that this isn’t just an eternal void. Or something. Basically showing that there is some form of movement going on the site that involves a new page as opposed to “be back soon”. Of course, this is all up to Greliz. Nigh 14 months has passed between the two updates. In that time, lots of things have happened. Anyways, I’d like to thank Mr. Griffiths for his perseverance and endurance even in such times. The next update should be the 20th of July, though it may be pushed back a bit.